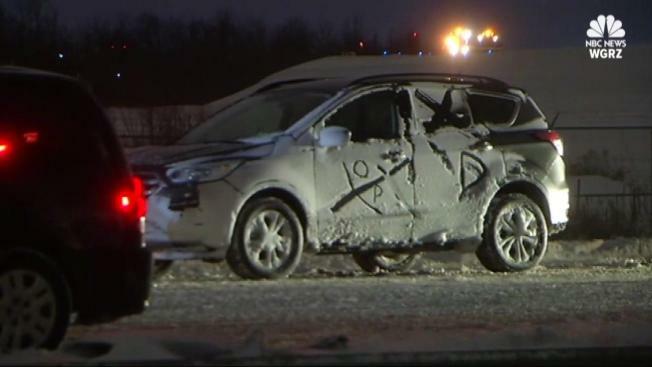 "All of a sudden everybody was sliding"
At least one person is dead after a 22-car pile-up on New York's Interstate 90. The crash happened Tuesday afternoon around 4 p.m. Witness video showed a mass of cars snarled in the crash directly after the accident. New York State Police identified the man killed in the accident in Cheektowaga as Edward Torres, 64, of Elba. One other person was hospitalized with serious injuries. Snowy conditions are believed to have been a factor in the crash. Icy weather appreared to have caused this mass car pileup on the I-90 West in Buffalo Tuesday afternoon, as captured on video by witness Kadire Flowers. Some witnesses on social media estimated up to 100 cars were stuck in the multi-vehicle crash which snarled traffic about 4 p.m.
"All of a sudden everybody was sliding," said crash survivor Tammy Dawn. "I actually decided to put my car into the ditch because I saw a truck that went into a car right in front of me, so I know that my car didn't hit anything." Accident investigators said an initial accident on the I-90 forced a tractor trailer driver to stop abruptly. They said Torres was unable to stop in time and hit the tractor trailer. Torres was taken by ambulance to a medical center where he was pronounced dead.